Families and their children are healthier when they are supported by their community in specific ways. All families need basic supports like food, shelter, clothing, and health care to thrive. Likewise, when families encounter a crisis such as job loss, domestic violence, mental illness or substance abuse, adequate services and supports need to be in place to provide stability, treatment, and help for family members to get through the crisis. Strategies in this area will focus on creating better choices for all families within a better overall system of formal and informal supports – that are more accessible and match everyone’s needs – while also providing specific support to families facing the most difficult circumstances. Assistance for Needy Families (TANF) or child-care subsidies. These supports can be universal (meaning open to everyone), or designed to support families living in particular circumstances of high stress. Informal supports are described as the people and community in the lives of children, adults, and families. These may include extended family, neighbors and colleagues who help each other. These supports help individuals to develop a sense of social belonging, dignity and self-esteem. Families often face challenges in accessing the supports they want, because the early childhood system is fragmented and sometimes difficult to navigate. Demand for services often far exceeds capacity of providers. This strategy involves the implementation of “Integrated Service Collaboratives” which help connect families to resources by providing child development screenings, care coordination, parenting information, and services to children prenatal through age 5 and their families. Each collaborative provides parent-child playgroups and also helps families with referrals and coordination of services. 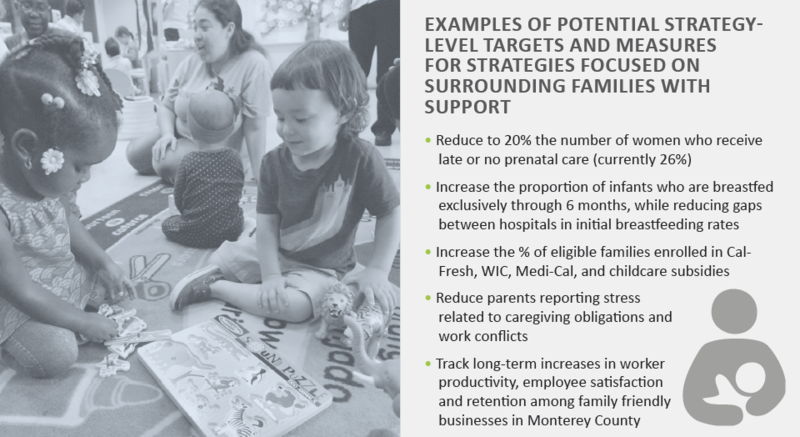 This approach is currently being piloted by First 5 Monterey County and partners and – if effective – could potentially be scaled up to reach more families. It is implemented in coordination with many other strategies listed here (e.g. home visiting, mental health screening, which are also provided by the Collaboratives). Parent-child home visiting is an evidence-based practice that provides an opportunity for families to learn age-appropriate strategies for supporting their children and receive support in their own home. It involves having some type of trained support person (often a nurse or other paraprofessional) who visits the home on a regular basis. Home visiting is generally provided before/after birth and continuing for first two years of life, and is targeted at first time and high risk mothers. Home visiting has shown positive impacts when implemented universally. Parent-child home visiting is an evidence-based practice that provides an opportunity for families to learn age-appropriate strategies for supporting their children and receive support in their own home. It involves having some type of trained support person (often a nurse or other paraprofessional) who visits the home on a regular basis. Home visiting is generally provided before/after birth and continuing for first two years of life, and is targeted at first time and high risk mothers. Home visiting has shown positive impacts when implemented universally. Click here to learn more and RSVP. The Advisory Group identified a need for a particular focus on supports to increase duration and exclusivity of breastfeeding, in the context of home visiting programs. Evidence-based home visiting and lactation support programs directly influence parenting behaviors, and if done effectively, can help parents strengthen their own resilience and empowerment, while reducing child maltreatment and positively impacting children’s development. Various home visiting programs are currently in place in the County, ranging from visits from a public health nurse, to trained Certified Parent Educators, and visits from a community health worker or promotora. Implementation of this strategy will begin by taking stock of current home visiting programs in the County to increase coordination and evaluate focus and potential for scaling. Our ideal strategy would aim for universal programs for home visiting (with lactation support) that would reach everyone with differentiated, culturally-tailored supports. This strategy aims to reduce external stress on families to improve parents’ and their children’s well-being. It supports a host of specific business practices and policies that can improve the well-being of working families. Paid family leave is one specific policy change to allow more parents/guardians (biological or other) to provide care for young children with paid leave for 24 weeks. The workplace can be either a barrier or a support for working parents to reach their own breastfeeding goals. Exclusive breastfeeding is a crucial first step in protecting the health of mothers and infants, nourishing infants and building a foundation for a healthy immune system. Hospital and workplace practices have an enormous impact on infant-feeding success. Other “Family-Friendly Business” practices and policies include providing flexible work schedules or providing onsite childcare to make work environments more conducive to parent and child development. Currently, Bright Beginnings is working with local chambers of commerce to recognize businesses demonstrating best practices. This strategy could be modified and scaled up to support additional changes in policy and business practice.